Survival kits, also known as disaster kits or 72-hour kits, are meant to sustain people during emergencies and disasters. Basic tools, food, and water are all usually a part of these kits. The disaster survival kit is the cornerstone of any prepper’s contingency plan. It is an in-place kit designed to sustain survival for yourself and your family. While we call it a kit, it is not necessarily stored all in one place, and we actually encourage dispersing your resources in your home to lower your risk of losing it all. 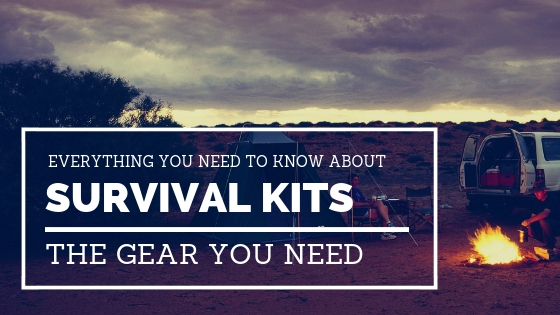 We break our survival kit list down into the seven focused areas necessary for the kit. This may vary slightly from the 5 Survival Pillars, simply because it assumes you have shelter in your home and have other common resources available. Back Stock Your Pantry – stocking all the food in your pantry with longer shelf lives can be an easy way to chip away at food storage. Legacy Food Buckets – a pre-packaged bucket system is one of the easiest ways to increase your food stockpile. Can Your Own – learn a new skill with canning, if you do not know how already. You can only live a few days without water and you should have a plan to store, filter, and purify it. Water is very heavy at 8.3 lbs per gallon. This poses a problem when creating mobile kits, like a car kit or bug out bag. In home survival kits don’t have this problem, so stocking up is one of the easiest ways to knock this element of the kit out. You want water for the entire family for three days. Assume each person requires one gallon per day to keep the math easy. Ongoing water collection solutions are also a great way to tackle water storage, using rain collection barrels or your very own well. Back Stock Your Pantry – Buy extra bottled water to start your water storage plan. WaterBOB – Great for disasters, this thing instantly turns any bathtub into a disaster water reservoir. WaterBrick – Stackable storage cubes for storing water. You will need to cycle the water out every so often. Rain Collection Barrels – A rain collection system can provide a near-constant supply of water but is susceptible to droughts, attacks, and other unforeseen problems. Sawyer Mini – The Mini is a versatile filter that is great for one person’s use. Its portability makes it ideal to use in a bug out bag, but it can also be used in an in-place kit. It’s size is a drawback for extended use or more than one person, so adjust your filter choice accordingly. Once the water is filtered and free of particles, boiling or chemically treating is a smart idea. You can also use UV or electrolytic purification. Potable Aqua PURE Electrolytic Water Purifier – This handy tool uses readily available materials and is easily long-term sustainable. It can also even eliminate the need to filter, if needed. Like the Sawyer Mini, it works well in portable kits, providing some redundancy. Tools cover a very broad area that receives the most scrutiny when people are preparing a survival kit. Flashlights, hand tools, lighters and many others fall into this category. You probably have several of these already around the house. You can gather them up and store them as a ‘kit’, but we prefer to just know where they are and keep them dispersed. Lighters – You need the ability to start a fire. You may add redundancy here in the future with more lighters and other ways to start a fire. Tea Candles – These provide just enough light to maneuver in the dark, making them perfect for survival kits. Hurricane lamps with large candles make good permanent decorations that have survival utility. Flashlight/Lanterns – Have at least one per person. Rechargeable batteries and a way to recharge them are a good idea if you are relying on battery power. Batteries – Batteries store for long periods, but you will want to check expiration dates periodically. Also be sure to store properly and not in equipment to avoid corrosion damage. Like we just mentioned above, rechargeable are ideal. Duct Tape – One of the most versatile items in the kit is self-explanatory. Construction Grade Trash Bags – for impromptu ponchos and, well, trash. Tarp – Use for patching holes in your house, collecting rainwater, and many other uses. Cordage (550 cord, bank line, rope) – You do not need them all, but they all will not hurt. Mylar Blankets – If the heat goes out, you be glad you had this lightweight solution. Camp Stove – Hot food is better than cold food. You can also keep extra propane or charcoal for your full size grill, if you have one. Can Opener – Need a way to pop open those cans in storage; keep a backup in your kit. If you store buckets, you should look at a bucket opener as well. Access to Tools – Purchase a small tool kit if you do not have many tools. Spare Keys – A survival kit is a great spot to stash spare keys for your vehicles. Over $100 in Cash – Stash this inconspicuously in a place you will remember. Keep the cash in small bills. Heavy Duty Gloves – You will not be just sitting around in a disaster. Be ready to work! Fire Extinguisher – Store an extinguisher in addition to the others deployed in your home. Poor sanitation can be a surprising enemy when you and your family are in survival mode. Sickness and infection were the biggest killers in pre-modern times, and any societal collapse situations would surely take us back to these conditions. Toilet paper is often a subject of ridicule when it comes to prepping- but seriously, who likes to run out of toilet paper? Toilet Solution – A bucket commode can help you keep things clean. Overstock your favorite toilet paper and consider a portable bidet. Wet Wipes – They are the quickest way to get clean on the go. N95 Masks, Gloves – These are great for sanitation work and double as being useful with other biological hazards, such as pandemics. Bleach and Other Solvent Cleaners – Killing bacteria is the goal here, and these can get it done. Bleach can also double as a way to clean water and keep it potable. Baofeng Two Way Radio – For normal use, you will need a HAM radio license to operate, but that will not matter much if SHTF. It is useful to get your license anyways though, since you will learn more about the bands and how to operate the radio. Cell Phone Solar Charger – A cell phone is a great distraction, but also a powerful communication tool. Keep it charged to send text message, browse emergency information, and to receive calls. Solar/Crank Radio – The old battery powered radio you keep in the drawer gets a much-needed upgrade with solar and crank power options. Personal Info and Files – Bank info, medical history, identification, passports, family pictures for identification, etc. Store this stuff where you can get to it quickly, preferably in a fireproof safe or bag. Local Maps – Print copies of free local maps and keep them on hand for emergencies. Survival Guides and Info – Your favorite guides and books are great to have around. You can even store an e-reader with the files on it if you have a way to keep it charged. Preppers span a wide variety of beliefs and ideas, but almost all of them recognize the risk of a home invasion or confrontation. When times get tough, history shows that we can sometimes turn against each other. While it is always good to approach situations with an open mind, you should hope for the best but prepare for the worst. Firearms – You wouldn’t take a knife to a gun fight. If you are uneasy around firearms, taking classes and getting time in at the range learning proper technique and safety precautions can be one of the best preparedness decisions you can make. Non-Lethal Weapons – Stun guns and baseball bats take the cake here. The reach but maneuverability of a bat makes it a formidable weapon in a home. While firearms are almost always preferred over non-lethal, they still have their place. Home Defense Equipment – door bars, impromptu alarms, and other equipment to further secure your home is a great addition to the kit. Turning your home into a fortress can be easier than you think. Once you have a solid plan and kit for basic in-place survival, you should bolster your plan and kit for additional threats and to provide longer sustainability. You also need to forge a bug-out plan and kit as well so that you have options in the event of a disaster. Components of your survival kit can be used in the bug out kit, but redundancy in your equipment is always smart. I choose to have a separate bug out bags for my family so that they are a grab-and-go solution. Learn everything you need to construct a solid bug out bag here: Bug Out Bags.